A weekend in early July (7th and 8th - pre the British Championships in Hull) saw Hull host Jovanka Houska for two events - our latest in the series of ECF-sponsored Hull Grandmaster@TheLocal (following on from James Adair and Michael Adams in previous years) and the fifth in our current series of simultaneous exhibitions, The Hull Grandmaster Challenge. Although we were apprehensive about the number of people turning out for the open air event on the Saturday, due to England playing in the world cup on the same day, plus several of our local players representing Yorkshire teams in the national county finals, we needn’t have been worried. Jovanka takes on one of the younger members of the public to play, with Steve Thrower (Hull CC) on hand to help out. 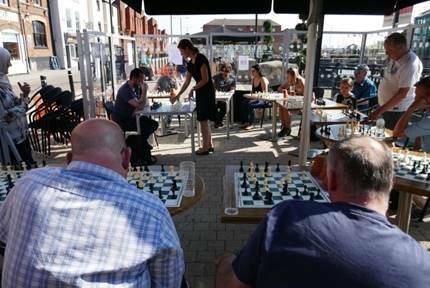 On a warm July day, at Furley and Co on Princes Street, Hull (our regular outdoor chess venue), our only mistake was not to put enough boards out! Not wanting it too look sparse we initially arranged just a dozen or so sets. 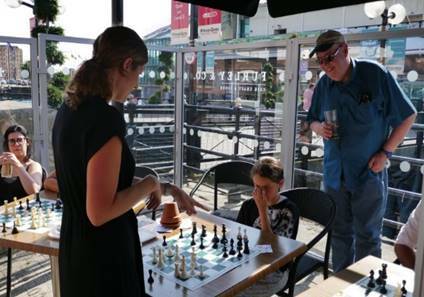 It turned out to be an incredibly popular event and at times we had a queue of members of the (non-regular chess-playing) public waiting for a game. Maybe 50 people took the opportunity to play Jovanka during the afternoon (regular chess players and the public alike). Helped along by 35 sponsored pints of the specially-brewed Grandmaster Ale, the interest from passers-by was very encouraging. Play continued for three hours, with a determined Jovanka not taking a single break until it was time to retire to a nearby restaurant for a well-earned rest and meal. 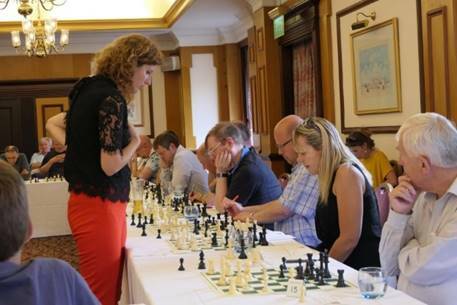 On the Sunday afternoon (July 8th), Jovanka took on nearly 30 local players in the fifth of our series of GM simultaneous Exhibitions, held in the excellent Elizabethan Suite of the Royal Hotel, Hull. Local players fared a little better than on previous occasions, where we had only recorded two wins in four exhibitions (see the October edition of Chess Magazine 2017 for a report on the previous events), and we managed to record two wins - for two Davids: Stothard (Hull CC; 139) and Stephenson (St Andrews CC; 161) - together with seven draws. David Stothard won the prize of a copy of Fritz 16, donated by Chess Direct. Jovanka kindly donated three of her own books, which were won by David Stephenson, Ashley Clayton (St Andrews CC; 129) and Steve Thrower (Hull CC; 111) – the last two of whom had obtained draws. Other drawing players were Douglas Vleeshhouwer (Beverley CC; 170), Steve Crow (St Andrews CC; 154), Oleg Dukalevs (HANA CC; 147), Mike Pollard (St Andrews CC; 144) and Shaun Taylor (Willows CC: 141). Despite a bit of a time scramble at the end (brought on by train times!) no quarter was given and after four-and-a-half hours' play Jovanka won three of the last five games with draws being recorded in the other two.